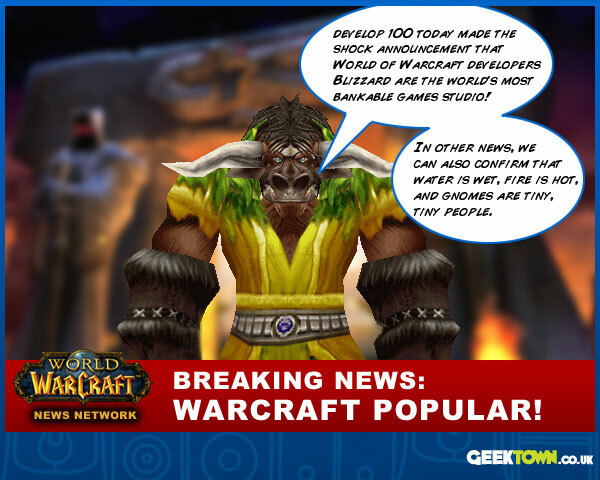 I saw this article over at bbc.co.uk in which Develop 100 have announced their top 100 software development studios, and it just got me thinking… is anyone actually all that surprised that Blizzard – the 11.5 million World of Warcraft subscribers/$1.34 billion annual turnover – software development juggernaut is top of the software developmer list? It’s becoming more and more apparent with each expansion that WoW has become a licence for Blizzard to print money. Then you add on the profit potential from the upcoming release of Starcraft II and Diablo III, and the Guitar Hero money from Activision‘s side of the business, and you could probably heat the whole of Activision Blizzard’s head office with rolls of $20 bills, and still never run short of cash! You can read the article in Develop 100 here. ← The Empire Takes Down Starfleet!